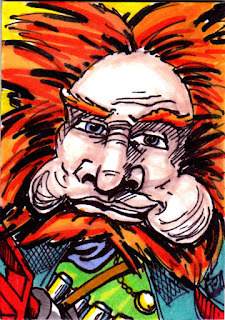 Taylor's Sweet Little Art and Nerd Site: Sketch Card of the Day- Gwildor! 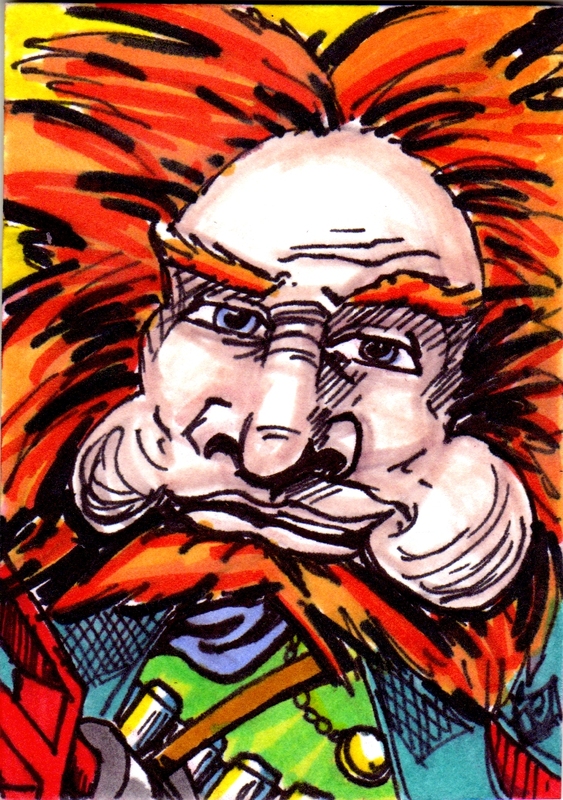 Our sketch card of the day is Gwildor! Gwildor is a character that was made specifically for the 1987 Cannon film, "Masters of the Universe". He is responsible for creating the Cosmic Key, a devise that brought He-Man and crew to Earth for a short while. He was portrayed by the actor Billy Barty. Even though this character is not an exact match, Gwildor is the Orko of the live action He-man world. I know he's not Orko, but he's a fun character to have in the universe! I love the movie and I'm a bit of an apologist for the film even though I take a lot of flack from my friends and family for liking the He-man movie. Now, this card is based more on the 1987 Mattel action figure, than the actual film appearance of Gwildor. There's not a lot of difference between the look of the two, except that the action figure is a little more colorful. The one big difference between the two is the cosmic key. The action figure's cosmic key is way, way off from how it looks in the movie. I can imagine that Mattel wanted to get the movie toys sculpted before the designs were finally approved. I believe that is not uncommon for toy companies to do. I am currently looking for a complete Gwildor action figure. There is not a lot of articulation with the toy, and his cosmic key can be considered kind of lame, but I have always wanted this him! I guess the child in me is excited about this character because in 1987, he's responsible for bringing He-Man a little closer to home. You can also see this art piece here.